This soup was the first one I crafted in our new place, craving some real nutrient-dense home-cooking after a week of being exiled from the kitchen. It’s wicked hearty, featuring whole grains, chicken, lots of chopped vegetables, earthy mushrooms and a secret ingredient to make it extra filling and creamy: cashews! This recipe takes advantage of some selective soaking to make it all come together seamlessly under pressure, in my Instant Pot (although you can easily cook it on the stovetop instead). The night before making the soup, I soaked both the brown/wild rice blend and the raw cashews in water (in separate bowls). For the grains, they are softened to allow a faster cooking time (more in line with the chicken breast they’ll share the pot with*). For the nuts, they need to soak so they can be pureed with a little water to create our plant-powered cream that is swirled in at the end, after the other ingredients are fully cooked. You can swap in a dairy-based cream if you prefer, but I love the balanced richness that creamy cashews bring to the table. Your efforts will earn you a pot of savory, stick-to-your-ribs, nutrient-dense satisfaction. Funny how a change of scenery can immediately drive me to cook something that had never crossed my mind before. New home, new inspiration, new go-to comfort food. *close enough, anyway… 20 minutes is longer than I normally would cook a thawed, whole chicken breast – but my chicken was still tender. If you’re concerned about it getting too tough, you can try a shorter cooking time at risk of chewier rice, or – ideally – start with frozen chicken instead. 12-24 hours before you plan to cook the soup: put the rice and cashews each in a small bowl, cover with tap water, and cover. Add the olive oil to the pressure cooker to cook over medium heat (press the 'Saute' button to begin cooking at medium saute heat). When the oil is hot, add the chopped onion, carrots, celery, mushrooms and garlic. Season with salt and pepper and saute, stirring occasionally, until the vegetables begin to soften. Stir in the stock, dried herbs and 1/2 teaspoon salt. Taste and season with more salt and herbs if desired. Drain the soaked rice, rinse it briefly with fresh water, then add it to the pot along with the chicken. Cover the pressure cooker with the lid, ensuring that the valve is in sealed position. Cook under high pressure for 20 minutes (with Instant Pot, press ‘Cancel’ to stop saute mode before closing the lid, then choose ‘Manual’ or "Soup" mode, and adjust time to 20 minutes). While the soup cooks, prepare the cashew cream. Drain the soaked cashews and place them into a food processor or blender with 2/3 cup water and a pinch of salt. Puree until smooth. When the cooking time is complete, allow the pot to de-pressurize naturally for at least 10 minutes before opening the lid. Pull out the chicken breast, chop it into bite sized pieces, and add back to the pot. Before serving, stir in the cashew cream and fresh parsley. This soup is fabulous! I made it tonight, first recipe in my new Instant Pot. My husband loved it, too. Your recipe is so clear and easy to follow. Thanks so much for helping me to start my Instant Pot adventure with such a success. I know I will be making this recipe again. Awesome recipe! I used 1lb of thawed chicken thighs (added a couple minutes to cooking time though I’m not sure it was necessary—I’m a newbie to Instant Pot) and it came out deliciously. 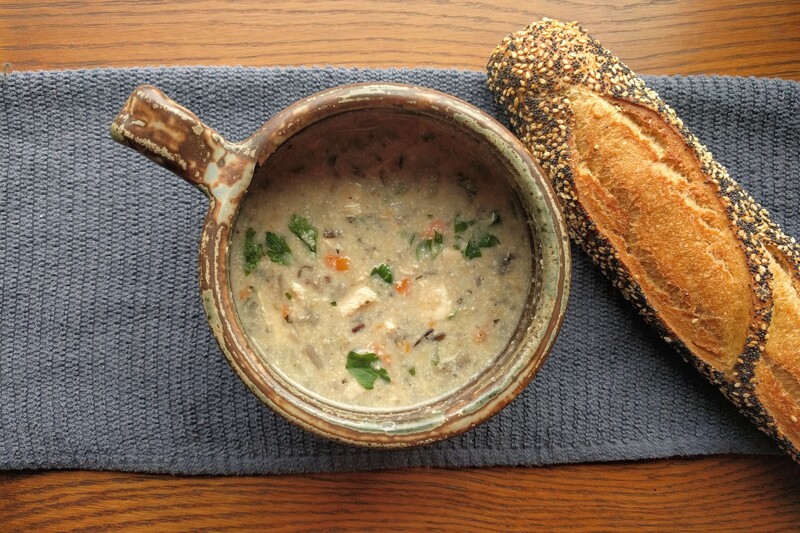 It’s so nice to find a creamy chicken mushroom wild rice soup recipe that doesn’t call for dairy too — thank you! Hi there, I have an allergy to tree nuts and dairy in my household. Do you have other suggested replacements to the cashews or dairy? For example will a dairy free milk work? To get the same creamy quality, you’ll want something with a bit of fat (like the cream or cashews both have). I don’t think rice milk would be very satisfying, but maybe something like a nice concentrated hemp milk or other seed-milk? I’ve heard some say that blended silken tofu with a bit of oil added is a good cream for soups when you have nut and milk allergies.